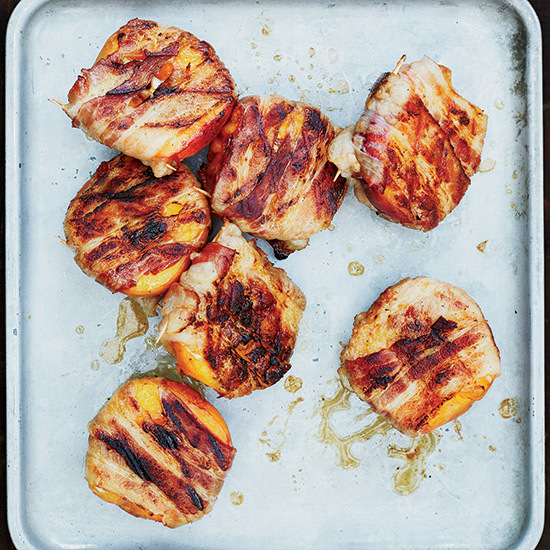 From juicy grilled apricots to fresh mango salsa, these seven terrific appetizers take advantage of summer stone fruits. What's the secret to this fast hors d'oeuvre? Grilled scallions tucked into the peach pit nook. This delicious version of the Greek dish saganaki (fried cheese with lemon) highlights manouri, a milky white cheese made from the whey that's drained off during feta production. Upgrade the classic tomato-basil salad with juicy mangoes and briny feta. Try this incredible salad with apricots or other stone fruits, like peaches and plums. This chunky dip is ready in just 15 minutes. Super-ripe tomatoes and grilled apricots paired with creamy ricotta make a fantastic summer starter. Top Chef host Padma Lakshmi tops this simple salad with a zesty dressing featuring the sour Asian citrus fruit yuzu.